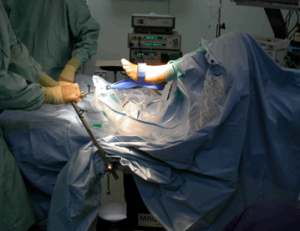 An ankle arthroscopy is a common procedure undertaken in foot and ankle surgery and is often performed to determine the true extent of an injury. 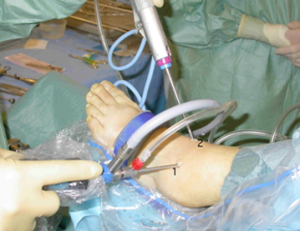 It involves making two incisions at the front of the ankle where the surgeon inserts an arthroscope (small camera) into your ankle allowing him to perform surgery inside the joint. A number of different soft tissue and bony conditions can be treated via arthroscopy including the removal of bony spurs, loose bone fragments or shaving soft tissue inflammation (synovitis) inside the ankle. Recovery rates vary widely depending on the procedure undertaken but will be discussed before your surgery.